With the myriad responsibilities, anxieties, assessments, and learners teachers have to juggle, sometimes learning just one more tool can feel overwhelming. Obviously, my job is to put teachers at ease and to help them to see that the technology is just a different way to do a lot of the same things students already do. But that can be difficult to visualize. Today, I had the opportunity to share with a group of passionate and dedicated 4-6 educators some ways to help engage learners using their Interactive White Boards. Our district has chosen to utilize Promethean boards, which offer a TON of great resources and lessons via their online community called Promethean Planet. Today, teachers created accounts, learned how to browse and refine resources, and then discussed ways these lessons could be used in class. I always love listening to teachers share and generate ideas with one another. That’s why I love working with educators! We all have so much to share, even if we think what we do isn’t necessarily mindblowing or earth shattering. Spending time discussing ways to get kids up and involved in their learning is always beneficial. Another tool I showcased for teachers was Kahoot – which is getting tons and tons of buzz in the educational world right now. Sometimes I think it’s helpful for teachers to see things from the kids’ points of view, so I had the teachers experience Kahoot from the student perspective first. As a presenter and instructor, who doesn’t love when their attendees feel like what you told them was helpful and worthwhile? But more than an ego boost, I like knowing that I have generated an excitement. How validating to know that I have worked to inject some enthusiasm back into something teachers do. As the teachers left, the principal remarked that she hadn’t heard so much excitement and energy after a training session in a long time. It’s not just that Kahoot is fun – it is definitely that. But, beyond that, the tool (because that’s what’s really important here) WORKED THE WAY IT WAS SUPPOSED TO. Teachers were impressed with the ease of creating their own Kahoot. They liked that it involved EVERYONE in the class at the SAME TIME. Teachers remarked that they appreciated how it was fair – everyone had the same opportunity. Before we left for the morning, I walked teachers through setting up an account and creating their first Kahoot. That felt like an important step for me, because I know for myself that I constantly learn about all these new tools but then never actually use them. Now that teachers have their own accounts, that’s one less barrier to them not using this in their classroom. We were even able to create a couple of questions for a quiz, so teachers could experience that as well. Today sort of feels like when you have a great lesson with students. You feel validated and inspired to continue to work hard. You get a sense that what you’re doing matters. Have you ever had a lesson that turned out “just right”? How do you get the feeling that what you do matters? Sooo…What is it you DO, exactly? I get this question a lot when I first tell people that I’m a Technology Integration Specialist. While those relatively new to the education world are more familiar with this idea, others have never heard of it. I kind of liken it to all the various acronyms we give to jobs nowadays. Secretaries are “Administrative Assistants”, we have “Customer Care Relations Specialist” for Help Desk employees. So, usually once I explain to people my role, they are excited and interested to hear how I help teachers and students. Working with 6 different buildings is a bit challenging, and the logistics of simply making it to all the schools and doing meaningful work is often difficult. Teachers have so much on their plates, technology is AWESOME when it works, random visitors, opportunities, assemblies, emergencies, etc. all pop up, and a myriad of other “crises” can derail even the best laid plans. With all of those (potential) obstacles, working with teachers and students is still incredibly rewarding – even if fleeting and short-lived at times. My job has been made possible through funding by a Federal Grant to support STEM and STEAM education in our nation’s schools. What an awesome and exciting time to be a support person! The incredible things students do, the intense level of engagement and connection to their learning…it’s awe-inspiring. I decided to create a short video of what types of work I’ve been doing in the month since I began working with teachers. You can view the video here. There are so many creative ways students are using technology to improve the world they live in and to enhance their understanding of complex issues. I cannot wait to see the fruition of some of the projects I have been supporting students on. What do you do that inspires others? What do others do that inspires you? Today I had the opportunity to speak to 7th and 8th grade students about the importance of Digital Citizenship and their Digital Footprint. We used pieces of the outstanding curriculum from Common Sense Media. We began with a discussion about what a Digital Footprint shows about a person, what assumptions people might make about them if they were to trace a person’s digital footprint, its impact on future selves. I was really impressed with students’ ability to think about the big picture and the future consequences their behaviors today may have. We then watched this video to remind students of how your digital footprint can grow, even without our permission. 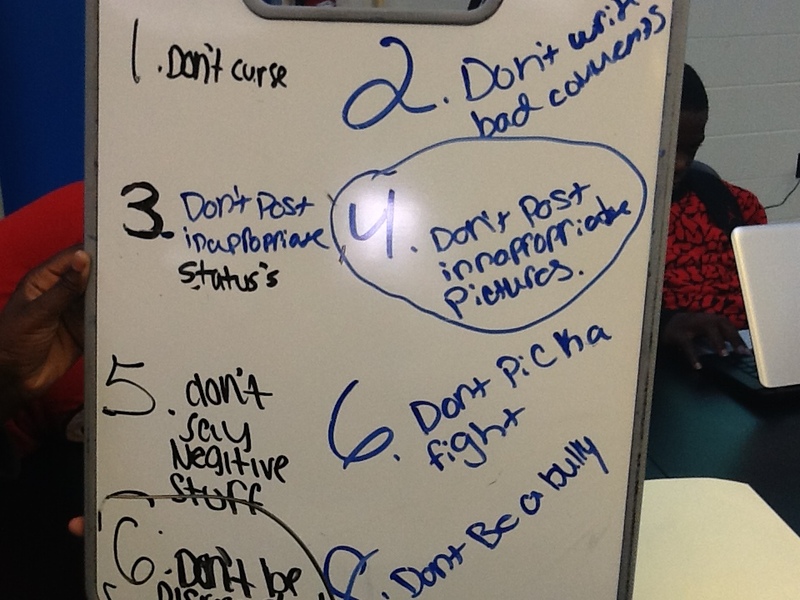 Once we discussed some of the negatives that would happen, we talked about ways students can make sure their Digital Footprint is reflective of what they would want the world to think about them. 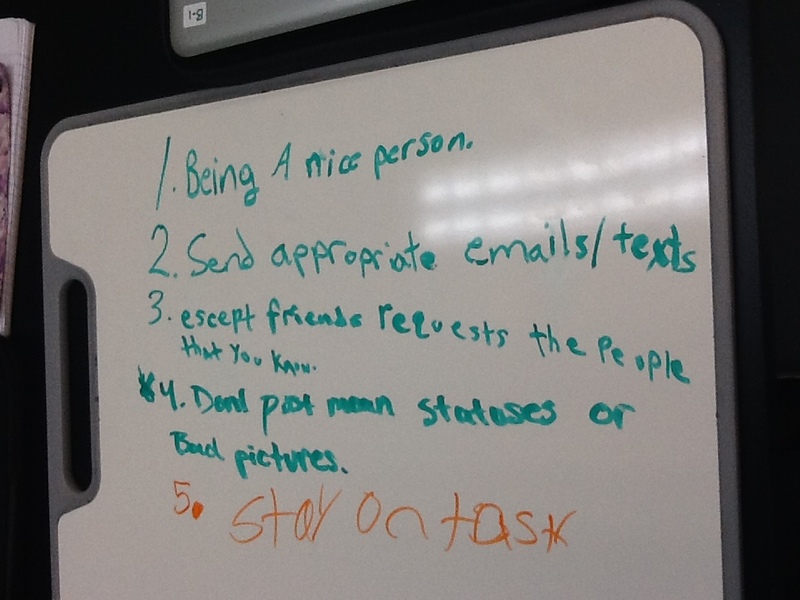 Students worked in groups to make lists of the things they should do or avoid doing in order to be mindful of the type of digital footprint you are leaving. A couple of things I posed to students I’m still puzzling over – we know what we’re supposed to do and what we’re NOT supposed to do, so why do these conversations still have to happen? Why do we still hear stories about cyber bullying leading to tragic consequences? Why are celebrities, politicians, athletes, etc. occasionally in the news about negative things that have happened to them? More importantly, students know what they’re supposed to do if they see or are privy to cyber bullying or other inappropriate content on their various social media and school accounts. Yet, over and over again, the majority of them stand by and do not speak up. I don’t blame students; many adults engage in the same types of behavior. Either we perpetuate it or we work to end it. Doing nothing does nothing to end the problem. Today’s work is another way I work with teachers to help educate their students not only on the consequences of their digital footprints and choices they make, but on how to continue to spread the message of how to use technology appropriately. As adults, we remember a world where technology was not such an integral part of our lives, but our students don’t. We have to teach them – and not just once or twice – how to harness its power for good and how to increase and build educational opportunities for them. How can we continue to educate students (and others) about our digital footprint? 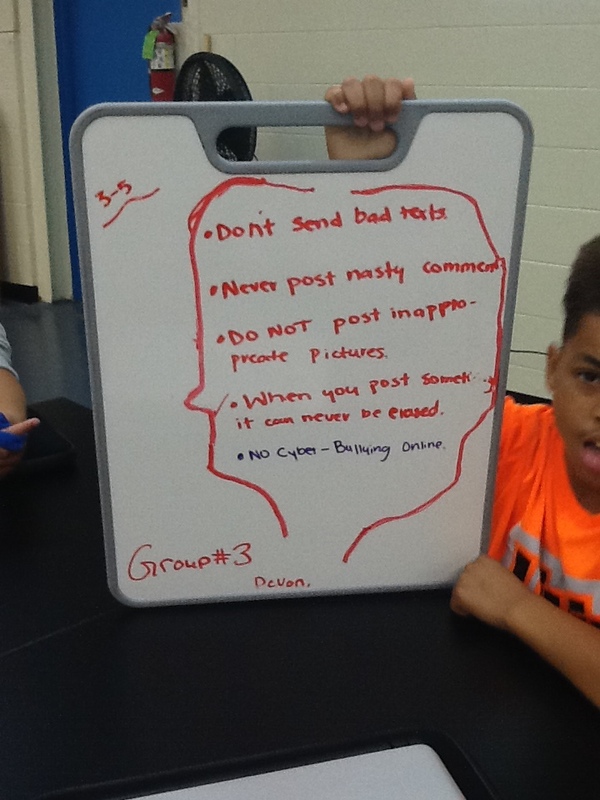 What ways can we model appropriate usage of social media so students know what it looks like?